Utilizing enhanced visualization in transportation planning and design gained popularity in the last decade. 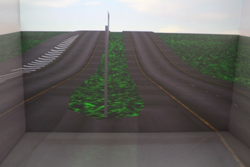 This work aimed at demonstrating the concept of utilizing a highly immersive, virtual reality simulation engine for creating dynamic, interactive, full-scale, three-dimensional (3D) models of highway infrastructure. For this project, the highway infrastructure element chosen was a two-way, stop-controlled intersection (TWSCI). Representatives from the Institute of Transportation at Iowa State University, as well as representatives from the Iowa Department of Transportation, experienced the simulated TWSCI. 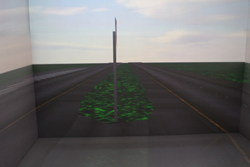 The two teams identified verbally the significant potential that the approach introduces for the application of next-generation simulated environments to road design and safety evaluation. The investigator is working with the Iowa State University Construction Engineering Highway Design course instructor on developing educational modules that utilize the developments.